Today, those who get "turned on" to Aldous Huxley (as they might have said back in the 1960s) get it through his books: the dystopian novel Brave New World, usually, or perhaps the mescaline memoir The Doors of Perception. But during Huxley's lifetime, especially in its final years from the late 1950s to the early 60s, he made no small number of adherents through lecturing. Having transplanted himself from his native England to California in 1937, he eventually achieved great regard among the region's self-styled intellectuals and spiritual seekers, giving talks at such mystically high-in-the-zeitgeist places as Hollywood and Santa Barbara's Vedanta temples and even Big Sur's famous Esalen Institute. But the prolific speech-giver also went farther afield, to far squarer venues such as the Massachusetts Institute of Technology. 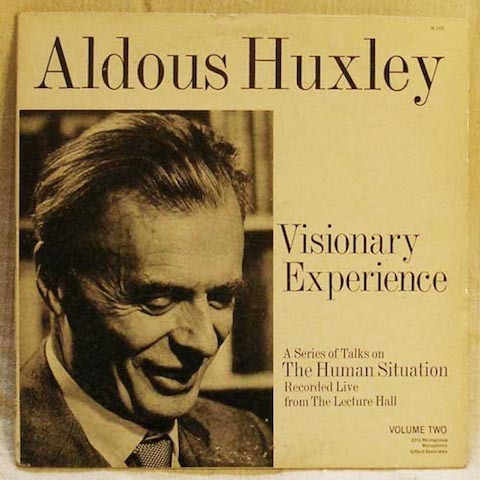 There, in 1962, he recorded the album Visionary Experience: A Series Of Talks On The Human Situation, which you can hear on Ubuweb, or right below. At that point, Huxley had already gained worldwide fame for his views on better living, which was sometimes achieved, he believed, through psychedelic drugs. This might have already sounded like old hat in, say, the San Francisco of the late 1960s, let alone the 70s and onward, but in these recordings Huxley says his piece in — I still can't quite believe it — the MIT of the early 1960s. But Huxley, diagnosed a couple years before with the cancer that would claim his life the next, had nothing to lose by spreading the word of his substance-induced discoveries. These would, as you may remember, even facilitate the death itself, Huxley's final visionary experience. To learn even more about all those that preceded it, see his collection Writings on Psychedelics and the Visionary Experience (1931-1963), that's available on the Internet Archive. While we here at Open Culture don't endorse drug use, we do endorse the words of Huxley as a substitute, and perhaps an even more vivid one. Does anyone know what Facebook page highlighted our Huxley post? Just curious. @Dan: It was the Aldous Huxley FB page. This was so utterly fascinating. I definitely have a strong desire to experience these mystical visions and ecstatic states. Huxley is almost preternaturally eloquent and profound. Thanks so much for helping bring this to people’s attention. Hi Am a Belgian citizen and travel to Kenya every year. I have a blind friend and was try’ing to finf him braille books in English, which i can’t find here in Europe. am looking for downloadable audio books, so I can give him an old MP3 of mine with books. He’s been blind since he was born, dropped at the road by his parents cause he was to much bother, and raised true a NGO where they thaught him Shiatsu massage. His name is Jackson. Any suggestions where I can find downloadable books ? “While we here at Open Culture don’t endorse drug use, we do endorse the words of Huxley as a substitute …” but you probably take ASA or get regular Flu shots. What hypocrisy.